Transferring to USC from Long Beach City College, McCullouch was a member of the 1967 national championship team, catching 30 passes for 540 yards and five TDs and receiving all-conference recognition. He was also a track star and held the world record for the 100-meter high hurdles from 1967 to ‘69. 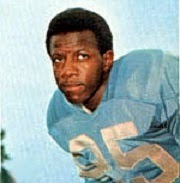 McCullouch was one of five USC players taken in the first round of the 1968 NFL draft when chosen by the Lions with the 24th overall pick. Lions went 4-8-2 to finish fourth in the NFL Central Division. McCullouch’s rookie season ended up being his best. He caught 33 passes for 539 yards and five touchdowns in 1969, but injuries limited him to ten games and 15 catches in ’70, although five were good for TDs and he averaged 18.5 yards per reception. Inconsistency became more of a concern as McCullouch averaged 26.3 yards per catch in 1971, but on just 21 receptions for 552 yards. He lost his starting job to Ron Jessie and caught a total of 14 passes in ’72 and ’73. The Lions waived McCullouch just prior to the 1974 season and he appeared in three games for New Orleans, catching just one pass for five yards. He played with the Portland Thunder of the WFL in 1975, catching 12 passes for 219 yards (18.3 avg.) and three TDs in what was his final pro season. Overall, in seven NFL seasons, with virtually all of the action coming with Detroit, McCullouch caught 124 passes for 2319 yards (18.7 avg.) and 19 touchdowns.